Backhoes and excavators have a shared general purpose -- digging -- but the two machines have different designs that reflect their specific intended uses. Generally attached to a front loader or tractor, a backhoe has a two-limbed arm with a digging bucket on its end. The limbs are called the boom and the dipper; the dipper holds the bucket. An excavator also has a boom and a dipper with a bucket on the end, but is also attached to a cab that sits on a vehicle with wheels or tracks. Most excavators weigh between 3,500 and 200,000 lbs., although the biggest one weighs 889 tons and produces 4,400 horsepower. Having the cab connected to the boom means operators can rotate a full 360 degrees if needed to carry out digging jobs. Some of the more well-known manufacturers include Caterpillar, Benati, John Deere and Komatsu Limited. Excavators have a wide range of industrial and commercial applications. They can dredge rivers, help clear spaces to manage forest fires, cut brush (with the right attachments), demolish buildings, grade soil for landscapers, dig holes and trenches, help with mining and heavy lifting, and even drive piles. 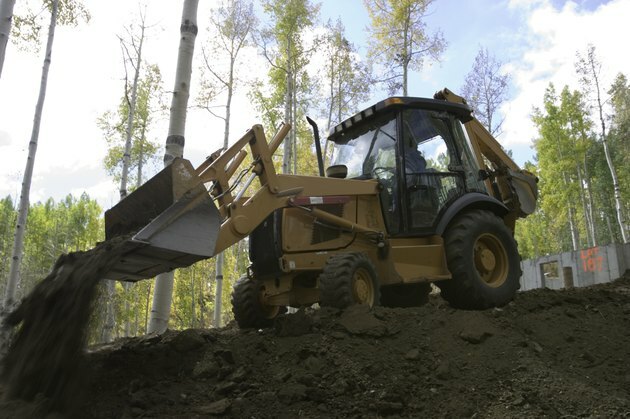 A backhoe derives its name from the action it produces: pulling earth back toward the vehicle. The primary difference between a backhoe and an excavator lies in the fact that an excavator has its own chassis beneath it while a backhoe attaches to a separate vehicle. Backhoes are available in farming models or in models designed for industrial uses. The farming models tend to weigh significantly less because they don't have to carry the same load as industrial models. Backhoes are also useful for digging different types of holes or trenches. Common hydraulic attachments include tilt rotators, grapples, augers and breakers, allowing backhoes to do everything from drilling deeper holes to carrying heavy tools. However, excavators and their smaller version, the mini-excavator, are making the backhoe obsolete outside of farming applications.